Aaron Weissman can tell you from personal experience the best people to have around when you break your tibia and fibia is a group of Boy Scouts. “My kids are awesome,” he said. On Sunday, as Weissman was floating down Belt Creek through the Sluice Boxes Canyon with four boys and three adults affiliated with Boy Scout Troop 26 Great Falls, a sudden decision of his to cling to a raft in rough waters after the boys got to the shore caused his right leg to get pinched in between boulders. The decision resulted in a compound fracture of the tibia and fibula in his right leg, about 3 miles upstream from the Sluice Boxes boat launch, which required a lengthy emergency response to the scene. Before emergency crews arrived, the group of Scouts — two of which have earned Eagle Scout ranking — had Weissman’s leg splinted and wrapped. Scouts Jake Smith, Jack Dresel, Wyatt Tanner and Daniel Stone all helped with the process with assistance from Pack 26 Cubmaster Brandon Carpenter, Dean Tanner and Eric Christian, adults on the trip. Weissman said the trip was well-planned and followed Boy Scout protocol with the trip being registered with the local office and proper safety measures under consideration. It happened after the Scouts spent two months learning CPR and other safety training. 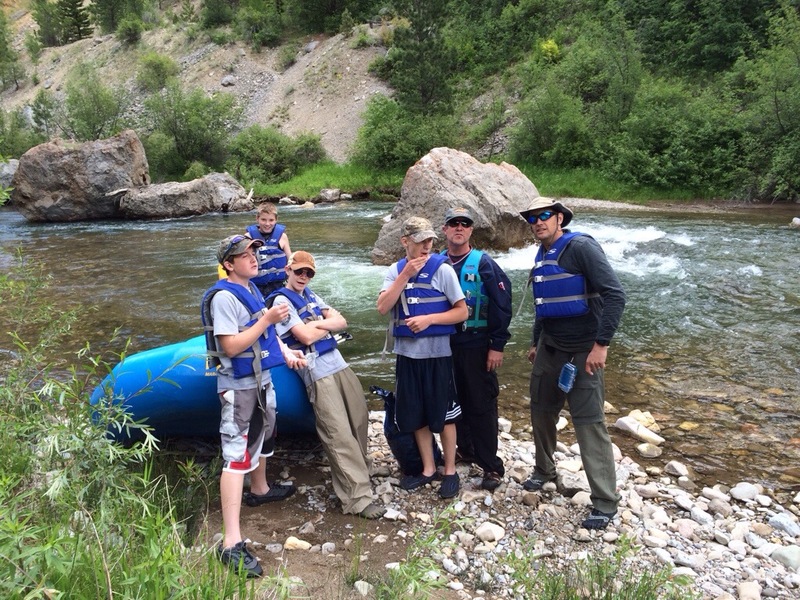 It was the group’s first time floating that area of Belt Creek. But just past the canyon, the group ran into some rapids. Weissman said he and one of the boys and two adults were in the main raft while the others had moved to the extra raft they were carrying for safety reasons. The boat spun and moved to the side of the creek and everyone was ejected. Weissman said while the boys got safely to the shore, he decided to keep a hold of the boat as it was filling with water. He thinks his right leg was jammed between two large boulders, where he said the combination of the stream and the raft caused his lower right leg to snap, approximately an inch below his knee. It was just before 4 p.m.
“I did find out I keep calm in an emergency,” Weissman said. Weissman called out to Bob Keith, who had been maneuvering the second boat and was fishing, that he was injured and learned Keith was farther down stream. He had to float downstream using his arms and one working leg and told Keith he needed to splint his legs to which Keith responded he couldn’t find anything to use as a splint. That’s when the Scouts got to work. Daniel, 11, started scouring the shores for something to use as a splint. “Once he told me he broke his leg I ran to where a big tree was fallen over and I grabbed a couple of straight sticks,” Daniel said. Meanwhile Wyatt, 14, scanned the area hoping to find rope to stabilize the splint. “I took straps off the boat while Daniel was getting the sticks,” he said. The other two helped gather materials and Weissman — though in serious pain — still tried to turn his injury into a teaching moment. “My first thought was, ‘boys, you need to watch this splinting process,'” Weissman said. The boys kept his leg in the water, splinted and covered with life jackets for protection, while others called for help. They were about three miles upstream from any access point along the creek. Weissman said originally Mercy Flight was called out, but there wasn’t an easy place for crews to land. Belt Ambulance Service responded and Dean Tanner said the crew had to run in three miles up the Sluice Boxes trail with a backboard to get to Weissman. The crew arrived around 5:30 p.m. The ambulance crew determined they couldn’t take Weissman back down on the trail, so they strapped him to Keith’s boat and floated him back out before taking him via ambulance to Benefis Health System. “It turns out, I have a high tolerance for pain,” said Weissman, who will be in a brace and a wheelchair for the next month. The boys said only after Weissman was loaded up in the ambulance did they begin to process what they’d seen and done. “It was unexpected; it escalated quickly,” Wyatt said. Jack, 14, and Jake, 13, said they were both in shock, but were eager to help as the events unfolded. Posted on July 5, 2014, in News of our Congregants, Ram's Horn. Bookmark the permalink. Leave a comment.